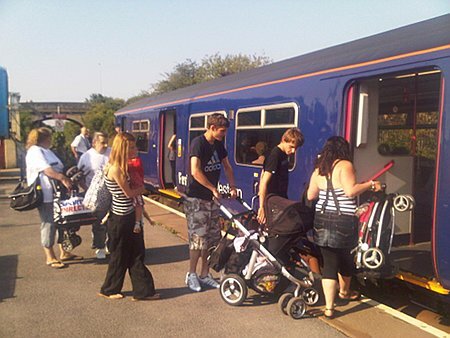 Bank Holiday Monday - 26th August - and there's a day trip opportunity by train from Melksham at 08:38 (also Chippenham at 08:29 and Swindon at 08:12) to Weymouth - get there at 11:03, set off back at 17:30 and get back to Melksham at 19:46 (20:00 at Chippenham, 20:20 at Swindon). The fare from Melksham is 16 pounds return / 8 pounds for a child, and if there's a group of 3 or 4 or more of you, you can get an even lower fare by buying a grouplsave ticket. From Melksham tickets can be purchased on the train because there's no ticket machine or booking office. From Chippenham or Swindon, buy at the station before you board. Change trains at WESTBURY in both directions. Two wonderful day out opportunities for the Bank Holiday! Trains run by (fares paid to) First Great Western, who have retimed the morning train on the Bank Holiday Monday at community request so that it makes a good connection and allows extra day out opportunities. The prices are good too ... Thank You, First Great Western!